Alain Juppe, the leading candidate to replace under-fire French presidential hopeful Francois Fillon, says he will not run, despite pressure to do so. Mr Fillon has denied allegations that members of his family were paid taxpayers' money for fictitious jobs. He has lost support within the centre-right party and in opinion polls ahead of the first round of voting in April. Mr Juppe, seen as his most likely replacement, attacked his rival's "obstinacy" but said he would not run. Opinion polls had shown that Mr Juppe would have progressed into the second round of the election. Mr Fillon is not projected to make it past the first round. What are the accusations against Fillon? They have been rumbling on for more than a month now - and the longer they have gone on, the more Mr Fillon has dug in (seemingly at the expense of his own chances of the presidency). He has fought allegations that his Welsh-born wife, Penelope, was paid for a number of years for work that she did not do as his parliamentary assistant. However Mrs Fillon, who insists she did work for her husband, told French magazine Journal du Dimanche on Saturday that "everything was legal and declared". Also under scrutiny are claims that two of the children, Marie and Charles, were paid by their father's office for legal work even though they had not yet qualified as lawyers. At a mass rally in Paris on Sunday, Mr Fillon told tens of thousands of supporters, once again, that he would fight on. But key members of his campaign team have abandoned him and several leading Republicans have wavered in their support. Who are the French election candidates? Is Mr Juppe's decision a surprise? Yes and no. Polls had shown the Bordeaux mayor would (unlike Mr Fillon) make it through to the second round on 7 May, alongside far-right candidate Marine Le Pen. But since losing the primary, he has repeatedly said he does not want to run as a Plan B. His announcement on Monday was consistent in that respect - he said it was "too late" for him to step in and unite the people. Mr Juppe, like Mr Fillon a former prime minister, did not hold back against any of the leading candidates on Monday. But he reserved his angriest comments for Mr Fillon, whose talk of a plot, and criticism of judges and the media, "has led him into a dead-end". "What a waste," he said. The pressure on Mr Fillon is likely to grow next week, when he is due to appear before a judge to be placed under formal investigation for embezzlement. In the short-term, his party will hold a unity summit on Monday evening, a meeting he has been urged to attend. His drop in favourability, and Mr Juppe's decision, look like clearing the way for the young centrist candidate Emmanuel Macron to battle it out against Ms Le Pen in the second round. Polls give him a clear edge over the National Front candidate. A big question mark now hangs over former President Nicolas Sarkozy. 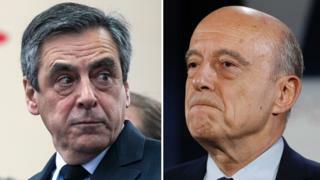 Defeated in the first Republican primary by Mr Juppe and Mr Fillon, he had earlier on Monday called for an emergency meeting between the three of them. Could he now put himself forward as an alternative? So that's it. Alain Juppe has ruled himself out of the race, blaming Francois Fillon for the disaster, and more or less washing his hands of the whole sorry business. Now there really is no choice for the Republicans but to accept Mr Fillon, courts and all. Or is there still a third option? Some say there is still a teeny chance that party bigwigs get together this evening and cook up another candidate - someone acceptable to both the Fillon and Sarkozy camps (Juppe no longer counting). The name of Francois Baroin has been mentioned. Anyone watching Fillon's address at the rally Sunday will have seen how Baroin - an ambitious young Sarkozist - finagled his way to a key spot on the podium in camera-view right behind Fillon. Just a theory. The point is no-one knows. It is all a total mess. The Republicans are in pieces. The prospect of a total redrawing of the party map - once the presidentials are over - is looking increasingly likely.